Talk about different. 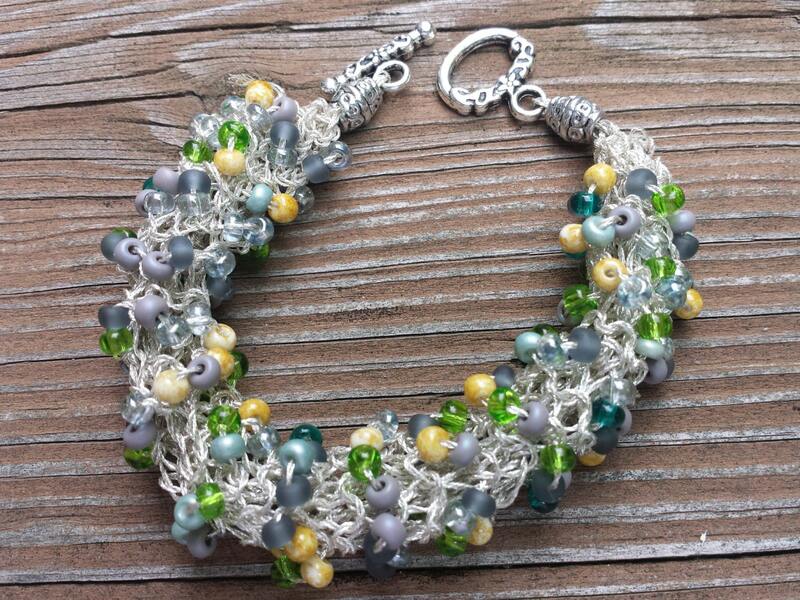 This bracelet was handknitted with silver metallic embroidery floss and glass seed beads. I couldn't have been more surprised with the results. The bracelet is light on the wrist and looks like a thick bangle. However, it is squooshy! It closes with a toggle clasp. It is very comfortable to wear and the beads just shine in the light. It measures 8" from end to end. I have a 6 1/2" wrist and it fits very nicely; no movement. This bracelet can be made bigger and smaller and of course, in many different colors. Just contact me if you would like something different. When purchased, the bracelet will be shipped in a padded envelope. Beautiful baby sweater and a bonus! The sweater was even more beautiful in person than pictured. The construction and knitting were perfect, the yarn very soft and the packaging was lovely. Thank you so much - this is one lucky baby boy! I love this hat - it's so cute and I can tell it's made with a lot of love! Robin is a wonderful seller who shipped very quickly and even included a lovely handwritten card! Thank you!!! I love this gorgeous necklace! For payment, I prefer Paypal. It's easy, quick and so far, painless. If there is a problem with this, please contact me and we can work out other means of payment. The price you see is the price you pay plus shipping unless noted otherwise. If you decide to cancel the transaction, I would appreciate it if you would do it within 2 days of purchase. I am eager to ship your purchase quickly so you can enjoy it. If there is a problem with the item and you are not 100% satisfied, I will be willing to make a refund or an exchange. However, the item must be in the condition it was when it was sent to you. If a knitted item has a problem, you can return it to me to be fixed or for a new one. Again, I am more than happy to work with you! Shipping is first class mail. If you prefer any other method, let me know. I want to work with you. Insurance will be extra, if that's what you desire. Just let me know if you want the shipping to be upgraded and I will be more than happy to do so at the additional cost. Jewelry will be shipped in a padded envelope unless you want a box. Let me know. The knitted items will also be shipped in a tissue-lined box unless noted otherwise. If you don't see something you want, or want something in a different color, size, motif, whatever your heart desires, let me know! I would love to help you get that perfect item. Please do not hesitate to contact me. I want you to be happy!